Sometimes I think I’d like to get away for Christmas and/or the New Year – away from what is usually a grey, damp, depressing England. (Of course, the last two years it’s been a snowy and cold England, but that’s very unusual – during my lifetime a white Christmas has been a long-odds bet.) And in recent years the thought of ‘getting away’ has immediately turned to thoughts of cruising. But would we really want to? And where to? Let’s list the advantages: a) the weather would be much warmer and drier, and b) someone else would be doing all the work. These can be tempting prospects. It’s probably me that’s especially attracted by the first point, and Val who can see all the arguments in favour of the second one. I don’t think I would want to go anywhere tremendously exotic – Christmas in Thailand doesn’t really appeal. What would be really perfect would be typical Mediterranean spring-like weather, but that’s a bit hard to arrange for 25 December, in the northern hemisphere at least. That brings us to one of the real disadvantages – the traveling. The easiest way to find the sun is to fly to it, but that brings its own set of problems. This year has brought dreadful weather to England in December, and as a result there were very few flights out of Heathrow (or other airports) last weekend and for several days during the week. As I said above this is unusual for this time of year, so most years there wouldn’t be a problem, but it’s nonetheless a worry that the fundamental requirement of getting away for Christmas, that of being able to get on a plane, would be a risky endeavour. So that’s probably a no-no to flying anywhere. The other possibility is to cruise from Southampton. That brings its own problems, without thinking of the business of getting to and from Southampton. Given that we’re both working we wouldn’t be able to take much time off at this time of year. So it could only be a short cruise – maximum 14 nights, ideally a bit less. The problem with such a short cruise is that there’s nowhere that close where the weather meets point a) above . Looking at today’s weather forecast for various points in the Canary Islands and nearby reveals sunshine and warm temperatures in Tenerife, but cooler temperatures and hail(!) in La Palma and Madeira. This hardly meets minimum requirements. Of course, any cruise would meet Val’s principal requirements – someone else to do the work. But I’m not sure I’d be able to stop myself thinking about the crew and how they felt: I’d wonder how many of them would really prefer to be with their families. For some crew members from some parts of the world Christmas may not be anything special: I don’t know to what extent it’s become a holiday for Indians (P&O employs many Indian crew members.) I also know that there will be many other crew members (e.g. those from the Philippines) for whom Christmas is a very big deal indeed, and I’m not sure how comfortable I’d feel having people who were away from the families through economic necessity looking after people like myself who’d chosen to leave their families behind in search of creature comforts. There again, if everyone took that view there’d be no cruises at Christmas and the crew wouldn’t be earning any money – it can be hard sometimes working out what’s the best thing. Maybe Val’s approach is best after all – it generally is. I can’t come to a conclusion, which I imagine means that we’ll be enjoying Christmas at home for years to come. 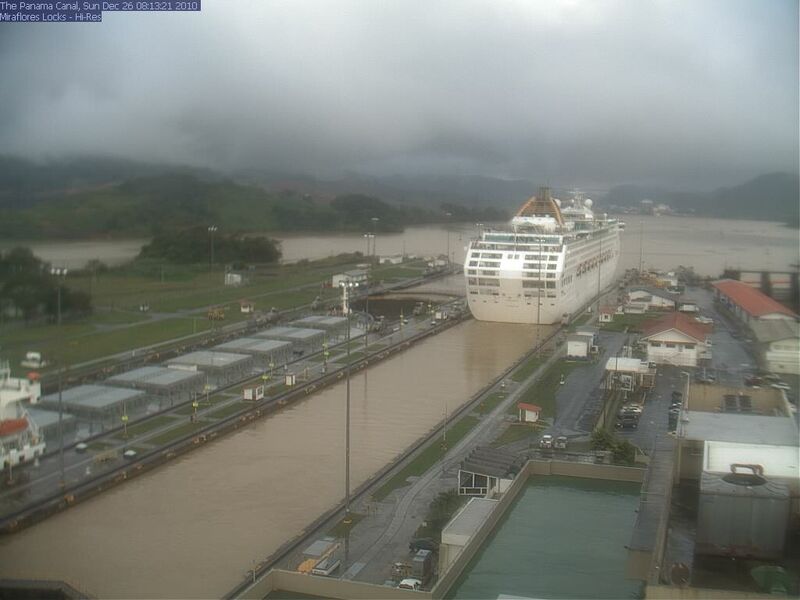 One last point: the picture at the top is of Oceana going through the Milleflores locks in the Panama Canal today, 26th December. I’m sure it’s warm there, but it certainly doesn’t look sunny. So scrub another possibility.